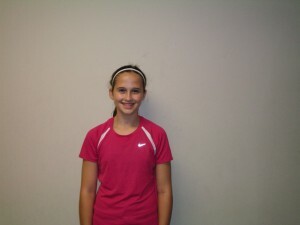 The 41st Member of the Soccer Fitness 20 MPH Club, Alyssa successfully completed 2 separate, 4-second running bouts, at exactly 20 miles per hour, on Thursday, September 22, 2011. She then continued to improve on her top speed until, most recently, she became the FASTEST FEMALE athlete ever at the Soccer Fitness Training Centre, reaching an impressive top running speed of 22.5 MPH on Wednesday, December 7, 2011! Alyssa is a defender and midfielder with the Woodbridge Strikers 1998 girls, who finished first in the OYSL East division, and reached the semi-finals of the Ontario Cup in 2011. At only 12 years of age, Alyssa has become one of the youngest ever athletes to run 20 miles per hour at the Soccer Fitness Training Centre. Her achievement is even more impressive considering she has only returned to training 1 week ago, after recovering from a 3rd degree ankle sprain which caused her to be sidelined for over 4 months. We at Soccer Fitness would like to congratulate Alyssa, and are looking forward to working with her throughout her soccer career.